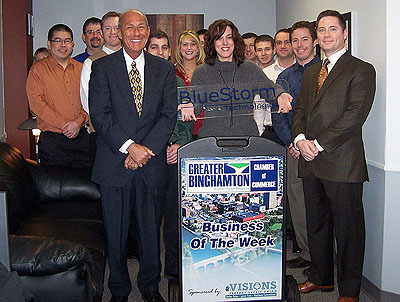 The Greater Binghamton Chamber of Commerce selected BlueStorm Technologies as the Business of the Week for January 4 – 8, 2010. BlueStorm stayed aggressive in 2009 by investing in new technology platforms and new hires, and looks to capitalize on these investments in 2010. The managed services offering expands BlueStorm’s infrastructure business by offering clients the opportunity to have BlueStorm’s team manage all aspects of their computer hardware and networking needs.